This is even more stunning in person. I love that it is real wood and not particle board. Definitely worth every dime spent. The baskets are also made quite well and are a fair size. The choice of knobs was also well thought out and works seamlessly with the entire storage unit. May buy another one to place elsewhere. It is that good. Keep clutter tucked away in the Damien 3-drawer Storage Benchfrom Safavieh. Crafted of sturdy pinewood with a dark cherry finish, this piecehas three handy drawers for smaller items above three ample pull-out wickerbaskets. 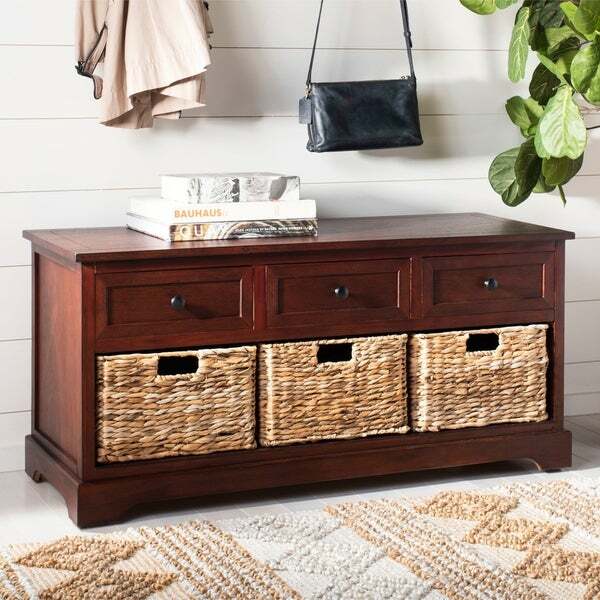 This versatile unit offers stylish organization for entryways, familyrooms, and bedrooms. Store shoes, accessories, linens, or books in this handyunit. Options are limitless, as it can even be used as a media stand for yourtelevision, or as a bench to sit by the window and relax. Add a contemporaryflair to your homes interior design scheme with this refined storage bench fromSafavieh. Wood is a natural material with variations of color shade, configuration, streaks, and grain structure. Each individual piece of Safavieh furniture has characteristic markings that will differ from photo and showroom samples. Regular attention and maintenance of fine furniture can ensure its beauty for years to come. Always use felt pads under all articles to prevent discoloration or softening of the lacquer. Plastic and rubber bases on items can discolor wood. Dimensions 19.7 in. H. x 42.1 in. W. x 15.4 in D.
I use this bench in our mudroom and it's great. I love the drawers and baskets to hold hats, mittens, etc. Also love that no assembly was required, unlike almost all of the other benches in the $***-*** price range. It seems very sturdy and both my husband and I have sat on it to take our shoes on and off w/ no problem. Very good looking and stylish! I really like this storage unit. Very rich looking, sturdy and very stylish. Fit perfect in my bedroom. Drawers and baskets very handy for extra storage. This no-assembly-required unit came in a snug box within a box and was in perfect condition. Very nice looking piece of furniture for a very nice price.Highly recommend it for home office storage. It was much nicer than the picture made it appear! I am very happy with my purchase. I took it out of the box and it was in perfect condition, I love it. I have it in my living room, and living in a small apartment it doesn't take up a lot of room, but definitely adds style. The drawers slide in and out easily and the color is absolutely gorgeous. The only complaint that I would have deals with delivery. According to the tracking information the unit was dropped off around 1:30 and I don't get off of work until almost 5. I would have preferred them taking the package back to FedEx for me to pick up instead of leaving it out on my front porch. That was the only complaint I have, but it has nothing to do with the product. The product is amazing; it is much higher quality than I expected. This is a great little piece in my office to store what I previously had in cubby holes with fabric totes. It’s a sturdy piece with 3 tiny drawers but you can fit small office supplies. It also offers a solid place for my printer to sit. It’s short but perfect for my needs. Bought this for my dining room. Need something that would fit under the widows. I was not disappointed. Liked it so much I bought one for my sister. The fact it came preassembled was just icing on the cake. Wish drawers slid a little eadier but overall this is a very functional an attractive piece of furniture. LOVE my new storage unit! Although I originally ordered this unit as a TV stand, it was really not long or high enough for my needs, but it is perfect for another area in my living room ! It's well constructed & color goes with everything else I have. I'm really happy with it. This is perfect. A tad bit smaller than I expected but it arrived already assembled and baskets came with it. It has held up well too! Very nice. fits well under the window. Hoping to ge plexiglass cut to cover the top so I can put plants on top. Really looks nice. Bought this for our front entryway. Looks nice. No assembly required so that was a bonus. Handsome looking, seems very study/solid. So far I am very pleased with is purchase. Baskets are nice too. Nice accent piece, but quality is truly a 3 out of 5. I really love how easily accessible the unit works. It came very well packaged with no concerns. Size and color worked; reviews were positive; already assembled. This is the second one I've ordered. Big plus is that it not only requires no assembly but it is a handsome piece of furniture which fits into the space I have for it. "What is the weight limit on this bench?" Hello, smunson95. This item has not been weight tested, as it is not not made to be used as a bench. It is very solid construction and shipped in one piece, and this indicates that you could probably store light items on top. Heavy objects are not recommended to be stored on top. "How deep are the wicker baskets? They look deeper than 4 inches. Thanks." The baskets measure 19.7 in. H. x 42.1 in. W. x 15.4 in D.